Slow Food Miami and Bee Heaven Farm have collaborated to organize the Farm Bike Tour, a fun locavore family event in observance of Earth Day. Start by registering at Bee Heaven Farm, then follow a 12-mile route that takes you on a tasting tour of three other local farms. Show up at the various stops and get a bite and something to drink (better than trick or treating, and you don’t have to dress up). You’ll also get to see a pretty part of farm country and visit various farms that you might not ordinarily get to see. Begin at Bee Heaven Farm, where farmer Margie Pikarsky will start you on your way with fresh berries, black sapote muffins and herbal iced teas. Next stop is Paradise Farms, where farmer Gabriele Marewski will offer mango smoothies and small bites. Then cruise over to Teena’s Pride, a family owned 500 acre farm known for its heirloom tomatoes, where you can take part in a tomato tasting. Next stop is Fancy Koi 2, an aquaculture farm where they grow not only koi and other ornamental fish, but also the very tasty tilapia, which you will get to sample. Then, finish the tour and come back to Bee Heaven to cool off with Gaby’s Farm ice cream and sorbets, made with local tropical fruits, and frozen lychees (Mother Nature’s own popsicles) from LNB Farms. Three very local ice cream makers presented their frozen creations at the Ice Cream Social at Bee Heaven Farm on the Fourth of July. All of the flavors were made from local, tropical fruit. Two fruits — lychee or mamey — were common to all three ice cream makers, and each brought at least one more flavor. Guests got a ballot when they checked in, and voted on their favorite flavors. (For official results, go see the Bee Heaven Farm blog.) Altogether, a person could indulge in more than 10 different flavors of ice cream and sorbet — a locavore ice cream eater’s heaven! Hani Khouri and his ice cream scooper ready to go! 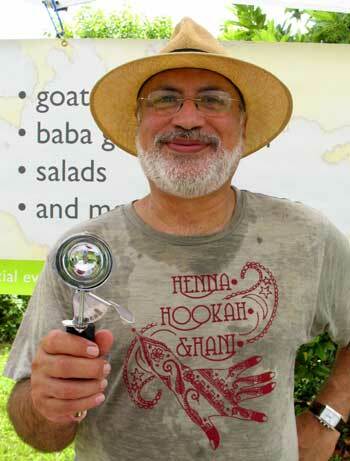 Hani Khouri, of Hani’s Mediterranean Organics, has been making ice cream with fresh goat milk for about two years now. He was definitely the artisan of the group. All ingredients were super local — goat milk from his herd of Nubian goats, fruit from Redland groves, and even local sugar. Hani bought guarapo, or sugar cane juice squeezed from locally grown cane, and evaporated it slowly over a low heat to molasses, then cooked it longer to get a brown sugar similar to panela. That process alone took several days. 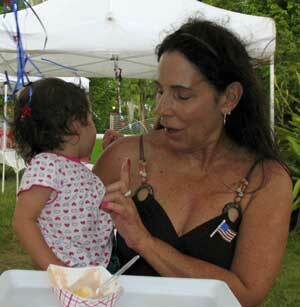 His mamey ice cream tasted mellow and fruity. Lychee was sweet but not too sweet. Lime was most unusual, bright yellow from turmeric, more on the savory side with ginger, cinnamon and other spices added for flavoring. It wasn’t obviously lime-y, and seemed to change flavor with every spoonful. Very interesting, because I hadn’t considered savory as a possible direction for ice cream (or sorbet). Hani also brought a pale yellow, sweet-tart cas guava ice cream with a light refreshing flavor. Saw passion fruit ice cream circulating, but didn’t get a chance to taste it. Overall, Hani’s ice cream was very light and refreshing, and the fruit flavors of lychee and mamey were bright and clear. The home made sugar gave a slightly gritty texture, and the lime ice cream also had little bits of lemon zest in its texture. Goat milk has a slightly tangy after taste that seems to work best with tart flavors. This summer I like cas guava very much (my new favorite? ), and last summer I liked arazá, another sour tropical fruit that is impossible to eat by itself but was terrific in ice cream. You can order ice cream online at Hani’s Mediterranean Organics. There are two pick up locations. In Dade, pick up at Sous Chef 2 Go, and in Broward, pick up your order at BM Organics. Gabrielle Berryer of Gaby’s Farm ice cream is the queen of the local ice cream scene. She has been making her frozen goodies from local fruits for 15 years and retailing for the last 5 years. Black sapote was the first flavor that she introduced to the public at the Fruit and Spice Park, and since then her line has expanded to 30 flavors, which are locally produced. All fruit is locally grown, and most comes from her two-and-a-half acre farm. Lev and Liz discovering Gaby's mamey ice cream. Gaby brought mamey, guava and canistel ice creams, and lychee sorbet. Her ice cream flavors taste more creamy than fruity, and the texture is silky smooth. Overall, her ice cream tastes and feels a lot like store bought. Dark pink mamey tasted much like a milk shake. Light pink guava was incredible combined with a slice of mango pie. (Yes, there was pie — and cookies too.) Canistel was egg yolk yellow (that’s why it’s also called egg fruit) and likeable with the addition of cream and sugar, but I’m still not a big fan. It could be more exciting if pumpkin pie spices were blended in. Lychee sorbet had a clear fruit flavor and was quite refreshing, but just a tad sweet. 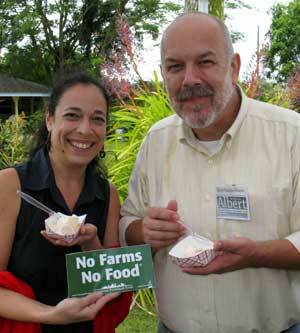 Find Gaby’s Farm ice cream at area Whole Foods, Fruit and Spice Park, Schnebly’s Winery and various local hotels. 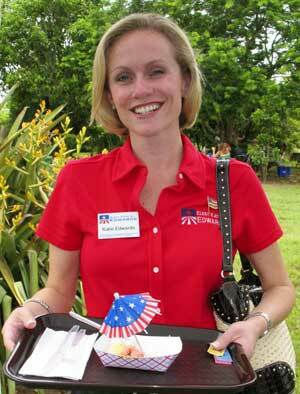 Katie Edwards with ballot in hand and one of the candidates. Robert Barnum was the jack of all trades of the bunch. 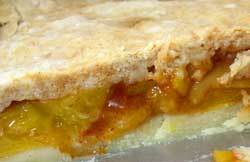 He brought the above-mentioned mango pie — and pie lovers, this one was for you! It was very tasty, especially with guava ice cream. Two Pie Are Squared, as he called it, was baked in two large sheet pans. He joked that he used “rectangular mangoes” for the pie filling. “I never do anything normal,” he explained. Rectangular or not, the mangoes were his very own Yellow Bellied Possum variety. Robert also brought lychee and peach ice creams and white sapote sorbet. Most intriguing was his Florida peach ice cream. Yes, peaches do grow here, and don’t let those Georgia folks tell you otherwise. Robert has several Red Ceylon trees, a wild naturalized variety that was cultivated in his grove since the 1950’s. The fruit has white flesh, red at the seed, with a pale green skin that never turns peachy yellow. The ice cream made with those peaches was rosy pink with little flecks of darker red skin and tasted sweet-sour, peachy-ish, a bit like strawberry but not quite. Robert explained that he picked early to keep fruit flies from infesting the peaches, “to keep the protein content down,” he chuckled. The fruit hadn’t completely ripened by the time it was mixed into ice cream. Would love to taste the ice cream made with a more ripe fruit, but it was pretty good the way it was. Robert also brought lychee ice cream, which tasted pretty good, having a nice balance between fruit and cream, and wasn’t outrageously sweet. The daring experiment of the bunch was white sapote sorbet, sweetened with local honey instead of palm sugar. To my tongue, which was already addled by sugar from the other two ice cream makers, this combination of fruit and sweetener had a slightly bitter bite. Robert describes the fruit as having an “astringent” flavor. Am not sure about this one, but then, I don’t remember if I’ve even tasted white sapote fruit. But I saw other people enjoying the sorbet’s unusual qualities, so it could just be me, spoiled by sweetness. Head over to Possum Trot, Robert’s place, for dinner and a tour of his 40 acre grove, one of the last bits of Old Florida left in the area. And best of all, you can ask him to make ice cream and pie for dessert! If you want to grow your own Red Ceylon peaches, seedlings will be available next spring.